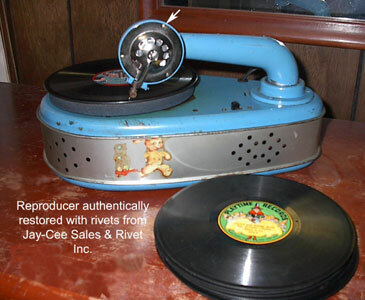 Testimonials | Jay-Cee Sales & Rivet, Inc. 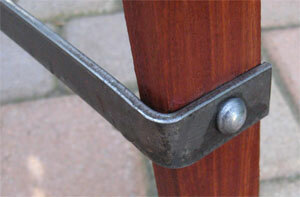 The attached link to the video is of how I used your rivets. 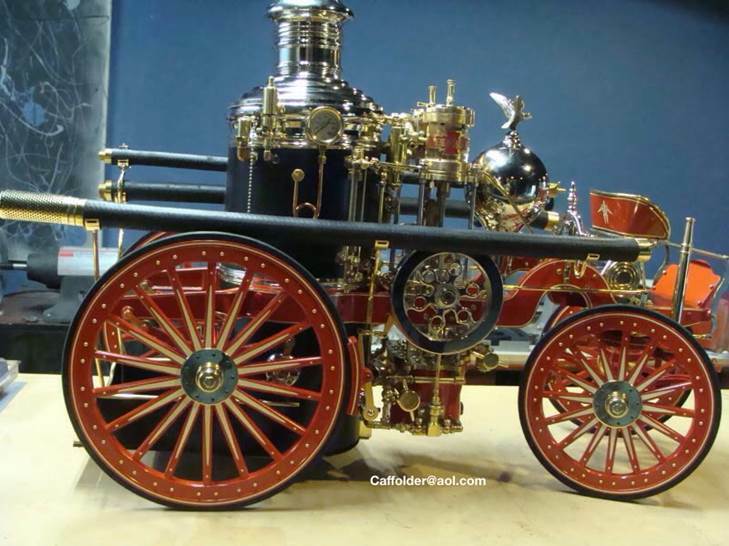 It is of an American La France Steam Fire Pumper from the 1800's in 1:8 scale. This was not built from a kit. It is a working engine and will pump water approximately 100 feet. In the video you will see the rivets in the wheels, in the sides of the coal bin which is located on the back of the pumper, and various other places. 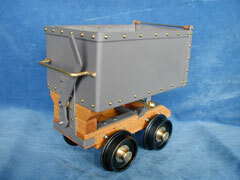 I am also working on 3 Wells Fargo type Stagecoaches which I am using your rivets on. On a side note your crew there has been very quick and helpful when ever I placed an order. 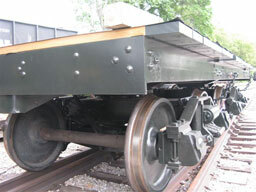 If ever you get in your catalog your smallest size rivets in longer lengths please let me know as they would be useful. 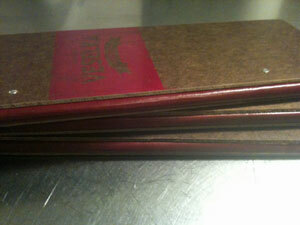 I got the order, I am astounded how well you take care of your customer even the ones as small as I am. I wasn’t sure what pictures you wanted to see of how I used the rivets. 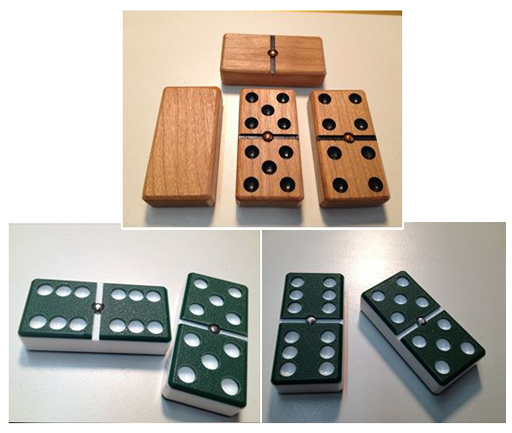 So attached are a couple of just the Dominos with spinners. As an accomplished aircraft mechanic with airframe and powerplant ratings I learned extensively about rivet applications, alloys, strengths and all required knowledge for construct with solid fasteners. Later as a student in 3D Design I wanted to use this knowledge in contemporary furniture design. Aesthetic is the inspiration for this series and the aesthetic is derived from a few places; an age old way of constructing objects similar to the Eiffel Tower or possibly a Ford Model T. I wanted to find a way to contemporize solid or semi-tubular rivets for new and interesting design work. 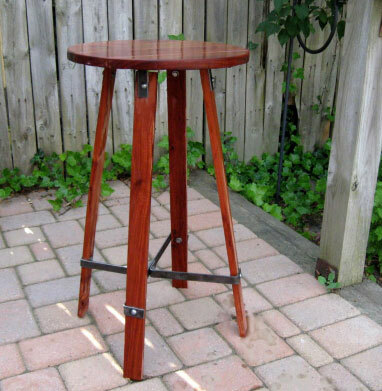 By using nominal size lumber (in this case remanufactured mahogany flooring) and nominal size hot rolled steel, a series can be created with minimal tooling and manufacturing costs yet retain an individual and timelessly interesting appearance. 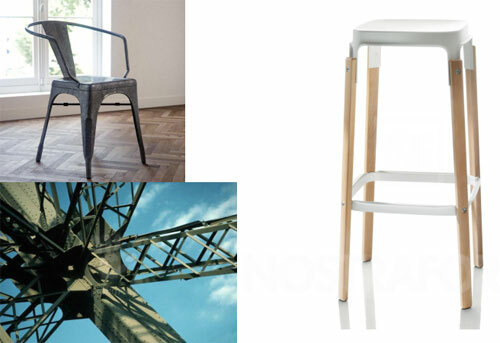 Influences for Solid Rivet Series include: Tolix Chair, Xavier Pauchard, industrial galvanized stamped steel assembled with solid rivets, Steelwood series, Bouroullec Brothers, Eiffel Tower construction, solid thermal rivets. 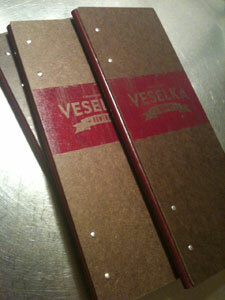 Thanks for your kind help when I was ordering rivets for my menu cover project. They turned out great, the client loved them and now I have a second order! 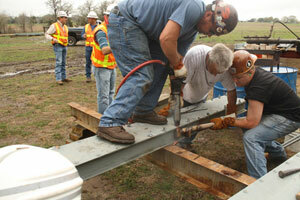 I have had the privilege over the last few months to document the restoration of the Piano Bridge in Dubina, Texas. Although Workin’ Bridges did not get the project for a rehabilitation and fix of the broken parts in place, we did enable the contractor, DaVIS Construction to have a bit of time to bid the project. 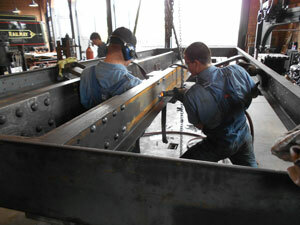 They utilized our same ironworkers from BACH Steel to do the repairs. Problem number 1, how does Workin’ Bridges make money when we aren’t a construction company yet? So the project was scheduled to begin in the middle of November, delayed until the week before Thanksgiving. Davis Construction was on site, but the BACH Steel crew ended up in a car accident, which derailed their construction schedule for some time. 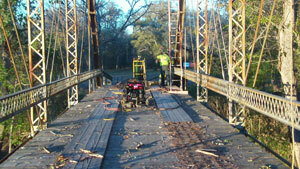 Thankfully they lived and Bob Schwensen, the supervisor for DaVIS already had experience in truss bridges. Schwensen had the skills and expertise to continue on and attach the strong backs to the incline end posts using equipment that was on site from BACH Steel, the crew pulled planks and stringers and executed the bridge lift on December 2, 2011. McCray Crane Service from Houston, Texas was hired to do the lift and it took only a few hours to set the crane and about 5 minutes to move the bridge, after a week setting it all up and preparing. 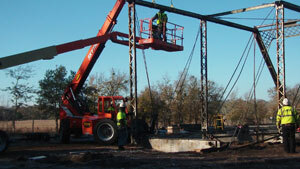 The disassembly of the bridge took several days, lots of heat and force and big wrenches. I was able to help at that point by saying that it would be impossible for one person to do that work and once they put two or three on getting the nuts and pins off, all proceeded smoothly. 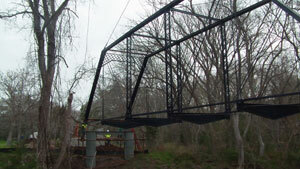 Engineering and plans were designed by TxDOT Engineer Charles Walker. His understanding of truss bridges is exceptional. He designed new splice plates, connectors and shoe plates. They also designed new tops for the caissons. 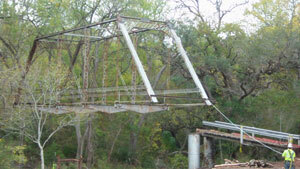 TxDOT trusts that fatigue and stress were addressed and the broken parts able to be fixed to bring this bridge back onto the road system for vehicular traffic. The holidays delayed work even more. Painters were not set up at that point and everyone left. In January the blasting of the parts began and BACH Steel arrived in the latter part of January to begin the repairs with Nels Raynor, Shane Milliken and his son Michael on the job. TxDOT applied for permission to change the AASHTO Standards that demand rivets should be replaced with bolts for this job. Where it had been riveted to begin with, rivets were used for replacement. Workin’ Bridges documentary was able to get rivets donated from JayCee Rivets and a 60lb hammer from Michigan Pneumatic, as well as Black Stallion gloves from RevCo industries to use for this project. A big thank you to those folks, all of their products figure prominently in most photos. BACH Steel began by heat straightening eye-bars, removing pack rust, fixing the lattice portals, and moving forward with riveting. Many TxDOT engineers and inspectors have been on site to see this process, check the heat in the forge and approve how it was done. That process took about 2 weeks and then the reassembly began in early February. 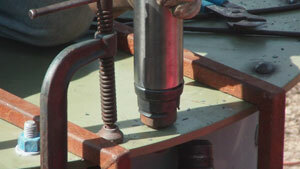 I was not there to document that process but was able to utilize photos from BACH Steel for this part of the job. 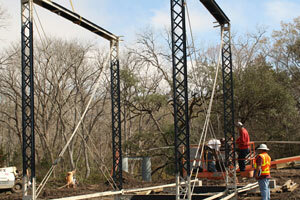 Yesterday, February 22, Ray’s Crane Service reset the truss over the East Navidad River where it has been since 1885. The stringers for the approaches are set, the stringers for the bridge itself are welded in place and the final painting has begun this last week of February. The road approaches are nearly done and clean up of the work site is finished. Davis Construction will start setting the decking, which was specified for Glulam planks instead of a traditional timber deck. The rest of the process should only take a few more weeks. The signs will be reattached, after being beautifully painted by S&S Painting’s Cecil Zimmerman out of Kerrville, Texas and the bridge should be reopened soon. Mr. Zimmerman also repainted the original King Bridge placques and they will be welded onto the bridge soon. Documenting this process has shown me that we can and must train more ironworkers in the skills that it takes to do this type of restoration work. Welding channel to channel or plates onto old iron is the same as it has always been, there was little packed rust but that was banged out with heat and a flat plate to hammer on (no direct force applied to the iron), rivets were taken out and new connectors were riveted back on, hub guard was straightened and repaired, pad welding took care of any section loss on the fishbelly floor beams where the original welded stringers were taken off and the vertical connector that was the critical failure was fixed. 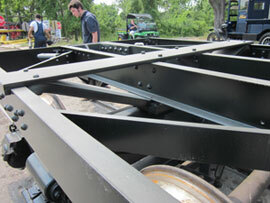 All connectors are new steel with more bolts, so the bridge is actually stronger than ever. Hopefully there will be a great party when this bridge reopens. 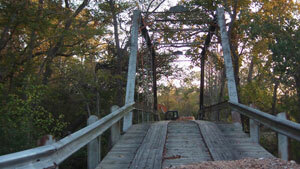 I will be there to document that and take photos of a fully restored bridge with traffic crossing it. Of course it won’t make that thundering noise like it did in the past but this is a win for the good guys. 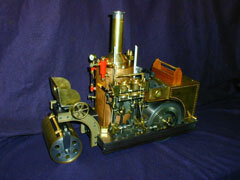 Here are a couple of color photos of my museum quality models which incorporate your products. 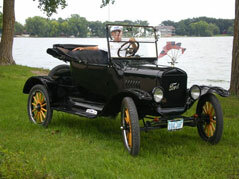 My restored 1923 Model T that Greg helped be by sending me a free sample of some flat head rivets to fasten the brackets beneath the fenders. You can just barely see them on top of the right front fender. Some rivet companies wanted me to buy 1000 as a min. order etc. Others didn't have them in stock. So I really appreciated Greg's help. I would have sent this sooner but I just ran across the number to call for an address--sorry--better late than never I guess. 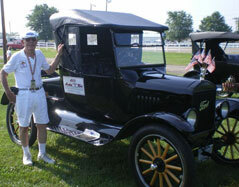 I finished it in June of 2007 and have taken in on national tours the past two summers. I wrote to you a couple of weeks ago, asking about prices for a couple of dozen rivets for an art project on which I was working. You totally surprised me and told me you'd send them along at no charge. I am now writing to you simply to say thanks, and am attaching two photos of the finished work, just so you can see were your rivets went. I used them in the construction of a wood picture frame, which is framing a WPA-era lithograph by Robert Muchley (1937, if I remember correctly). 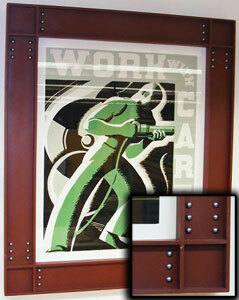 Since the print shows a guy using a rivet gun, it only seemed fair that the frame should reflect the same. Thanks again! 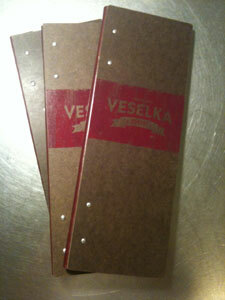 I will keep you in my contact book for the next time I (or any of my students) need some rivets. 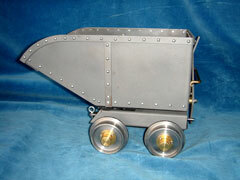 About a year ago, I contacted about 100 businesses about some rivets I needed to restore an old pedal car for my son. I could not get any one to help me out on the rivets except for you guys. I really appreciate all your help in getting me the rivets. I finally got the car done for Christmas and I thought I would send you a picture of the before and after project. Thanks again for all your help and I will definitely tell people what a great company you are. I am not quite sure who this e-mail should be addressed to, however, I wanted to inform you about a call I made to your company on Wednesday June 27th. I own a 1976 aluminum hull boat, and I have been struggling with rivet problems for three years. I finally decided to fix the rivets properly this summer, which means removing my deck, tanks chairs, etc. I have been reluctant to do so because every person I've talked to (including the manufacturer of the boat) have claimed that it is almost pointless to try and fix the hull. Until I spoke with your associate. His name is Jason, and his extension is 26 (I did not get his last name) and he was extraordinarily helpful, to the point where his knowledge and expertise even gave him the ability to address my concerns before I even mentioned them. Your company has a very talented salesman. It really takes knowledge of the product to anticipate what concerns the customer. His explanation of your product and insight into it's application were invaluable. Admittedly my final order from your company might not even be $100.00, and it is very doubtful I will have much need to buy rivets ever again, but I will do whatever I can to praise your company and its employees, particularly Jason. Thank-you very much and your help is greatly appreciated, you helped me turn a leaking sieve of a boat into an enjoyable pasttime again. 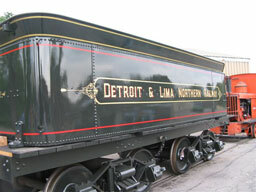 Another successful restoration using Rivets-In-Stock products. 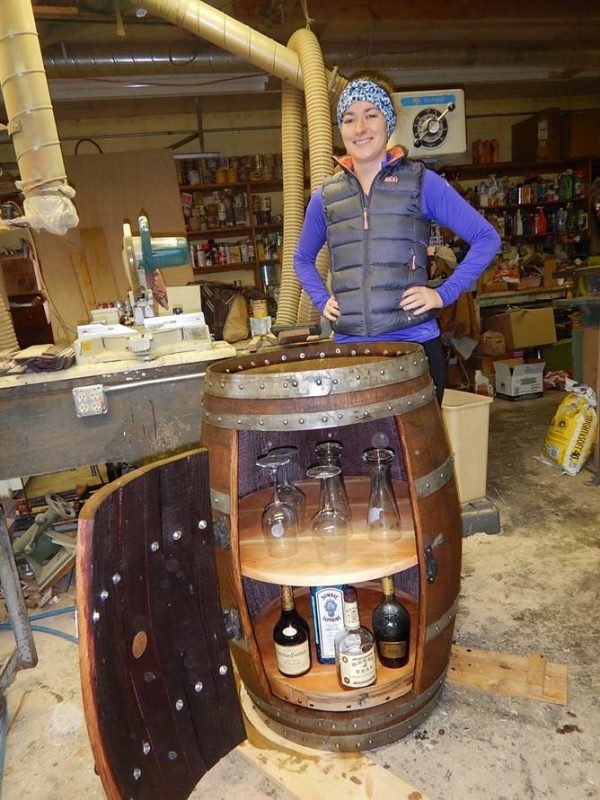 Here is the barrel liquor cabinet we made with your rivets.